- Melt the butter and milk together until warm, don't boil them. Put the mix in a big bowl, add the yeast and let it stand for 5min. - To this mixture add flour, sugar, salt, egg and mix together until it becomes a dough. - Place the dough on a generously floured surface, knead for 1 minute, form it in a big ball and place it in a lightly greased bowl. Cover it tightly and let it sit somewhere warm for an hour to double in size. - Place it on a floured surface again, spread it a little with your hands and cut it into 12 pieces. 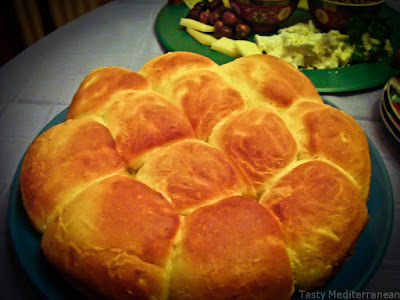 - Shape them into rolls and place them on a greased baking sheet. Make sure you leave some space between them, so they can rise. - Cover them with a towel and let them stand for another hour to double in size. - Preheat your oven to 190 C degrees. Bake the rolls for about 20min or until golden brown. - Glaze them with the melted butter and enjoy!